We study how ecosystems work, how they change, and what that means for humans. We want to understand what drives variation in ecosystem structure and function to better understand the ecological impacts of climate change and habitat modification, and to explore how conservation efforts can be most effective given natural environmental changes. more coming, please suggest good ones that focus on resources and solutions! Join us at the 2018 Gordon Research Conference: Unifying Ecology Across Scales! Isbell, F., A. Gonzalez, M. Loreau, J. Cowles, S. Diaz, A. Hector, G. M. Mace, D. A Wardle, M. I. O’Connor, J. E. Duffy, L. A. Turnbull, P. L. Thompson, A. Larigauderie. 2017. Linking the influence and dependence of people on biodiversity. Nature. M. M. Osmond, M. Barbour, J. oBernhardt, J. Sunday, M. Pennell, M. I. O’Connor. 2017. Warming induced changes to body size stabilize consumer-resource dynamics. The American Naturalist. O’Connor, M. I., A. Gonzalez, J. E. K. Byrnes, B. J. Cardinale, J. E. Duffy, L. Gamfeldt, J. Griffin, D. U. Hooper, B. Hungate, A. Paquette, P. Thompson, L. Dee, K. Dolan. 2017. Toward predictive scaling coefficients for biodiversity and ecosystem functioning relationships. Oikos 126: 18-31. Gonzalez, A., B. J. Cardinale, J. E. K. Byrnes, F. Isbell, G. R. H. Allington, D. G. Brown, A. Endsley, D. U. Hooper, M. I. O’Connor and M. Loreau. 2016. The challenge of estimating global patterns of local biodiversity change: a critique of recent papers finding no net loss of local diversity. Ecology 97(8): 1949-1960. Tseng, M. and M. I. O'Connor. 2015. Predators modify the evolutionary response of prey to temperature change. Biology Letters 11: 2015:0798. 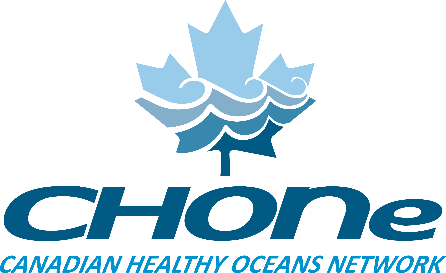 CHONe projects are sponsored by the NSERC Canadian Healthy Oceans Network and its Partners: Department of Fisheries and Oceans Canada and INREST (representing the Port of Sept-Îles and City of Sept-Îles).